This little volume is an endearing record of an undergraduate course, a music appreciation course designed for students with an interest in the music of the avant-garde of the 1960s, 70s and 80s taught by a man who was an integral part of that era as a composer, performer and teacher. The class, which he taught at Wesleyan University was reportedly very popular continues to be offered today. And this book is required reading for fans of new and experimental music. In just over 200 pages Professor Lucier takes the virtual class of readers through a very personal journey of the music, experiments and performances of some of the highlights of some of the major works and composers of this time period. And he manages to navigate all this wildly experimental music in a way that is understandable to a general audience (remember that this is an undergraduate course for non music majors). What makes this book so special and unique is its personal nature (Lucier was a composer, performer, organizer and interpreter of much of the music) and the particular networks to which he connects. Few historians save for Kyle Gann pay significant attention to the techniques which arose from the orbit of Ann Arbor, Michigan and composers like Robert Ashley, Gordon Mumma and Lucier himself among many others. But this group is indeed an orbit and not a universe unto itself. David Tudor, for example, crossed paths with these composers as well as, more famously, with John Cage and the New York School. 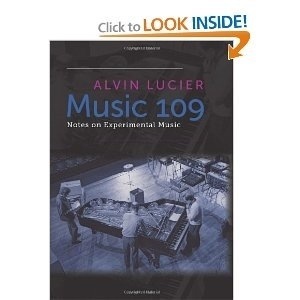 This delightfully readable volume narrates Lucier’s vast experience with and love for a variety of experimental trends. Lucier writes of his own works and places them within the contexts of fellow innovators including the above mentioned artists as well as diverse voices such as Pauline Oliveros, Philip Glass, Steve Reich, LaMonte Young, Roger Reynolds, Gordon Mumma, Robert Ashley, Earle Brown, Morton Feldman, John Cage, Christian Wolff, David Tudor, Karlheinz Stockhausen and many others. This personal inside view makes for entertaining and compelling reading which provides a historical context as well as insights to the “method behind the madness” of a diverse and innovative time in music history. Except for Kyle Gann’s fine volume on Robert Ashley this is the only book length treatment (known to this reviewer) of artists connected with the ONCE festival and the Sonic Arts Union. Lucier’s place in music history is connected across east coast academia as well as far less academically connected groups like these. This book connects some of those dots placing an important perspective on this era. Earlier this year I had the pleasure of speaking with Paula Matthusen, a composer who now teaches at Wesleyan. In fact she has inherited this delightful and inexplicably popular course. She told me that not only does the course continue to be popular, many of the students come in with some level of experience of this music and a desire to know more. How cool is that? Matthusen shares many of her teacher (Lucier’s) concepts in her own work but she is clearly the next generation in experimental music reminding us that art of the era documented is receding into the past yet we hardly know it. And how can we appreciate the latest work without some understanding of how we got there? Lucier’s book provides a great introduction and hopefully will encourage more attention to this important and fascinating time in American music history.